I received a notification that several of my posts are lost. That happens from time to time. It’s nothing for me . . . or you to get upset about. At one time I moved this website and didn’t back it up — so everything, back then, was lost. It was sad for me and sad for many of my visitors. But I started over . . . and through time, some links get broken and some posts do get deleted . . . so if by chance you’ve been looking for something here at TwoCansOnAString.com and get an error . . . hopefully, you’ll see the image to the right, with the word “oops!” to the left. Just click the image and you’ll be taken to the Home page. We make every effort to keep this website fresh and fun for all of you. We don’t like it that from time to time things get broken, but there is a lot of stuff here. Some old, some not so old, some new. I realized I am really heavy on Halloween . . . maybe you like that . . . and maybe not. We do have product review and crafts and holiday stuff, along with random thoughts. 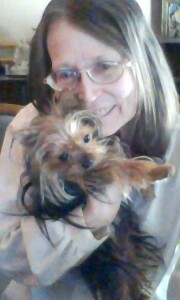 TwoCansOnAString.com is my fun website — it’s where I was able to introduce my little Diva — the Yorkshire Terrier from wonderful breeders from Wisconsin. It’s also where I can tell you about products that caught my eye and all the fun holiday stuff — I may even have a ghost story or two to tell you from time to time. It’s Raining!!! What am I to do? Well, I think crafts are in order. I do my best crafts when it’s raining and I don’t want to go out — but today I may venture out and pick up some grocery items. Little Diva wants something different . . . not a toy, but something delicious to eat. And I’m due for something different, too. But, I did get side-tracked there for a moment. Crafts . . . what do I want to make? What do I have that I haven’t shared with you before? Mr. Printable has some adorable bug boxes you can download and print out on your home printer. They’re great for spring and summer. 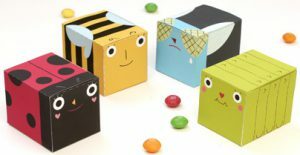 These favor boxes are easy to assemble and fun to fill with goodies. Just click the image to the left and you’ll be taken to the page where you can download these adorable bugs. I definitely like them. They may have been designed for younger children in mind, but I think they are suitable for everyone this spring and summer. They would look nice in Easter baskets, too. You know, come to think of it, instead of an Easter Egg Hunt, you could have a Bug Box Hunt . . . what do you think? I believe you could have some serious fun with these Bug Favor Boxes. My friends over at RavensBlight always make me laugh with the talent of Ray O’Bannon. Not only is there a Skeletal Band, but there are also Backup Musicians. They’re all FREE for you to print out and assemble. I suppose some introductions are in order: The Band consists of Nash, Mic and Boots. The Backup Musicians are Sky, Tony and Charlie. Just click the images to the right and the left and you’ll be taken to the download page over at RavensBlight. As I mentioned before, The Band and Backup Musicians are all compliments of Ray O’Bannon at RavensBlight. They are FREE to print out on your personal printer. They come complete with assembly instructions. These guys come with their own stage . . . and light show. As you download them, print them out, cut them out and begin assembling them, you’ll become a bit more familiar with them. You may not want to print out and assemble the whole band and backup musicians, you may have a drummer in your house . . . and Boots is the one for you . . . or the keyboard with Tony. Or, there could be one that has that special look about him that you can’t resist. A six piece band seems to be a winner . . . but you can choose the ones you want to print out and assemble. They’re an old group of guys that have been hanging out at the cemetery for much too long before Ray O’Bannon set them up at RavensBlight. They are a regular Friday and Saturday Night Hit . . . You can name the band whatever fits for your personal preference of music and style — even for the occasion. These guys love all the holidays. Have some fun with these skeletal fellows. Requires NO batteries. There are no strings to tangle. Just toss it high and let gravity take over . . . and maybe a little wind. With spring coming, kids need to get outside and have something enjoy. This would be great for Easter Baskets, stocking stuffers, birthday parties — each of your guests can take theirs home with them. It would be a great party favor. 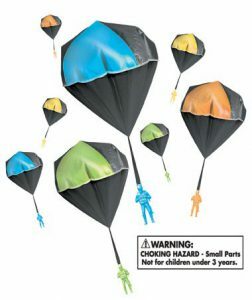 The parachutes are selected at random — you get one per order . . . so, if you want a selection, perhaps you’ll need to order a dozen or more . . . or they’ll all be the same color — that’s the breaks when things are just selected at random. I don’t personally find this a turn-off, but I can see how children may want a particular color and would be disappointed. That’s why it would be worthwhile to order several of them. They are great fun for boys and girls ages 4 years and up. Great for parties where children and adults can be outside. This is just a little selection to give you some ideas. Click any of the images and you can shop around to your hearts content. This is my 500th post here at TwoCansOnAString.com — I should make it something special. With Valentine’s Day right on our heels, I think maybe something to print out would be in order. Something simple for a children’s school or church party. Or something for you to give your special valentine’s. 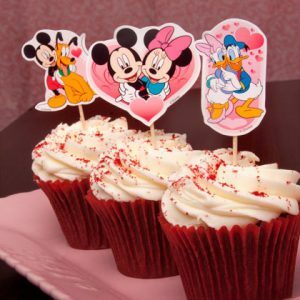 These Disney cup cake toppers and cup cake doilies are great . . . you can pack the cup cakes in a lunch or have them for dessert. They do look lovely. For the toppers, just glue on a toothpick . . . and for the cup cake doilies, you’ll wrap them around the cup cake papers to make them look festive. Just click the image to the left or to the right to download the PDF and print out. I do like these. I’m also wondering about other things that may be of interest to you . 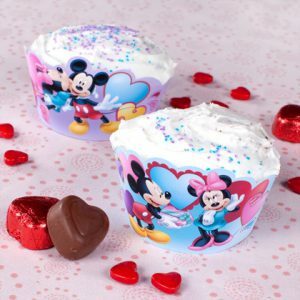 . .
We’ve done the Valentine Mickey Candy Box and the Valentine Minnie Candy Box . . . but what about a Stitch Valentine Candy Box? The links above will take you to the PDFs to download and print out on card stock. I think that would be enough to keep you busy this day before Valentine’s Day . . . I’m always thinking something else might be fun to make for you to give or decorate . . . or for your children to make and give to friends . . .
Something simple, but fun . . .
How about some Disney Lollipop Labels — They’re a Valentine that has a lollipop attached. They are cute and fun for your children to hand out to friends. There are five of them — Mickey, Minnie, Donald, Pluto and Goofy. I think they would be fun just to have around the house . . . or give at work . . . You could have them in a cup and people can pick the one that appeals to them. There are a lot of links on this page for you to click . . . I do hope in this 500th post, I have something you like . . . if not, it wasn’t for lack of trying on my part. Thank you for stopping by! Oh yes!! I’m giving you these at the last minute with Valentine’s Day being tomorrow, but . . . There are 8 Valentine Cards that you can print out on card stock and have ready for your family and friends. As you can see, they are from Disney . . . Tim Burton’s Nightmare Before Christmas featuring Jack and Sally. Just click the image to the right for the PDF you can download and print out on card stock. I’m sure your friends and family would love these uniquely macabre Valentine Cards . . . I think they would go nicely with the Skull Heart Box . . . You’re going to have to scroll down a bit to find the image of the heart box — just click it and you’ll see it is from our old friend Ray O’Bannon of RavensBlight who designed this heart box with spikes for your Valentine’s Day giving pleasure. I believe if you love Halloween . . . or ghosts . . . and ghost stories, you would love these cards . . . They are different, which would make them stand out from all the others that are handed out for the occasion. It’s all about having fun and celebrating your interests . . . no matter the time of year. I’m sorry I didn’t get them to you earlier, but I just found them . . . so, better late than my waiting until next February. I do love bring the macabre and paranormal into all holiday celebrations. Maybe a story would be appropriate at this time . . .
We’ve all heard about the poor woman who had been stood-up at the alter on her wedding day . . . maybe instead of a June wedding, it was on Valentine’s Day . . . and she haunts a bridge . . . or a grave yard . . . or a particular patch of road . . . I suppose it could be one of a dozen urban legends. So, since I said all that, your mind is racing through all the ghost stories and urban legends that fit the above scenario . . . I’m wondering if I have something different . . . maybe not . . . but I’ll try. It was Valentine’s Day, 2009 — it was on a Saturday . . . a perfect day to go away for a romantic Valentine’s Day weekend . . . or to celebrate with other couples. Valerie’s parents invited a few couples over to celebrate Valentine’s Day. She and her siblings were supposed to be in bed, asleep, but as children, they like to watch from upstairs . . . . and maybe get a few party snacks one of them sneaks down to collect and share. The adults moved down into the basement which was set up as a family room. It had an old time jukebox, television and lots of room for dancing, so the children thought it was their chance to sneak downstairs to get some left-over party food. Valerie and her brother Bob were the eldest, so when they heard loud knocking at the front door, they were the ones who looked out to see who it could possibly be since all the guests had already arrived. Their parents couldn’t hear the knovking from down in the basement with the jukebox playing and the laughter of their guests. At first they didn’t see anything, but the twins Taylor and Tyler were looking out the living room window and immediately ran upstairs. Valerie was torn between seeing for herself what was outside and going after the twins to see if they were all right . . . then they saw a man dressed up, wearing a top hat . . . in his hand was a bouquet of dead flowers . . .
No way were they going to open the door. Valerie was tempted to run upstairs as the twins had done earlier, but Bob let the dog out . . . thinking he would chase whoever was at the door. But, the dog came running back in, whimpering . 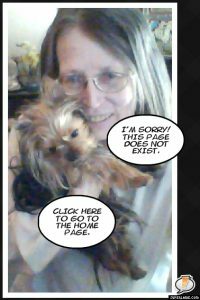 . . Well, if the dog is scared, Valerie and Bob decided they should be, too. They ran upstairs into the twin’s bedroom. They eventually fell asleep . . . but at exactly 3 AM in the morning they heard the loud banging at the front door . . . Valerie heard it first, then Bob . . . but their parents didn’t hear it. So, Bob and Valerie ventured out to see who was at the door. The dog stayed behind . . . this should have been a warning to Valerie and Bob . . . on the dining room table was the top hat . . . and the bouquet of dead flowers . . . Oh no!! Was he now in the house? Both children ran up the stairs . . . into the twin’s room . . . They eventually went back to sleep. Later that morning, there heard a scream coming from downstairs . . . They found their mother in their father’s arms crying. As it turned out, there was a great-great-aunt who was to be married on Valentine’s Day in that very house — owned by Valerie’s great-great-great grandparents. The groom never showed up. He was killed on his way to the wedding. That was a sad tale . . . but true. One never knows when loved ones come to remind you they are still around . . . In this case, the groom had finally arrived . . .